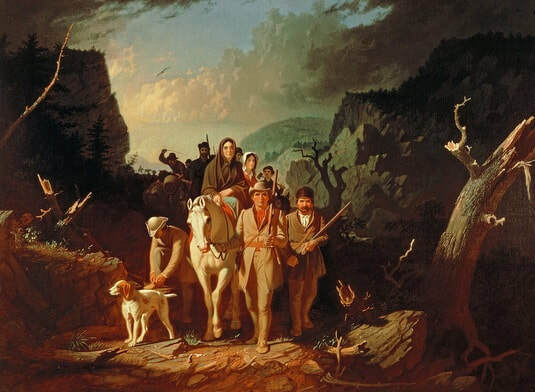 Daniel Boone - hero of the frontier? Let your students decide. Author Harness uses two compound adjectives in this Minute [so-called and salt-making], which give you the opportunity to explore the grammatical rules that govern compound adjectives and the proper use of hyphens. If you need some brushing up on the rules, check out this easy explanation, then give a mini-lesson and let your students try it out in their writing journals. Consider adding a classroom poster of the rules and examples students find in their reading and writing. This Minute refers to a “gauntlet” in the fourth paragraph - a word your students may not know. They may, however, have heard the idiom “running the gauntlet.” Use this Minute to introduce or reinforce the idiom, and have some fun brainstorming examples to share. See if your students can find the origin of each idiom. This Minute mentions Valley Forge, Boonesborough, KY and Chillicothe OH. Introduce students to map scales and teach them how to determine distances on a map. Have them measure the distance between Boonesborough and Chillicothe. Do they come up with 160 miles? How long would it take to walk that far? What geographic features might make the trip slower? Explore historical perspective - heroes? Daniel Boone is legendary in American culture. There are songs, clothing and parks dedicated to his memory. Ask your students why history treats Boone as a hero figure. Ask the more challenging question - how do they think Boone might be portrayed if the history they were reading came from the Shawnee or Cherokee perspective? Would Boone still be a hero? Ask why these historical memories may be different? Which history is correct? What does this tell us about studying history? How do you go about making salt from a mineral spring? Author Harness tells us Boone’s friends did this, so it must be possible without electricity and fancy gear! Have your students do some thinking about the easiest way to do this, and then test their hypotheses - with modifications, of course - no open flames in the classroom please! Summer is coming and there are lots of places to visit. Have your students search the National Park Service for Revolutionary War sites, for Daniel Boone, or simply have them search for parks near where they might be travelling this year (or want to travel). What can they find out about the history of the area? What events and activities can they discover?Show them the expanding menu and search bar at the top of the page.